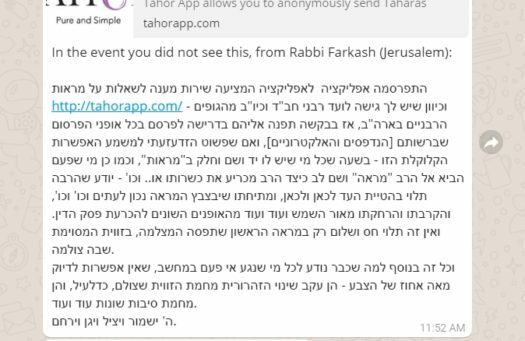 Rabbi Fishel Jacobs, the sole Chabad Rabbi who lent his endorsement to the ‘Tahor’ App, designed to allow women to privately submit Bedikah inquiries via photo, has apparently rescinded his support, as his name was unceremoniously removed from the website’s ‘Our Rabbis’ section. 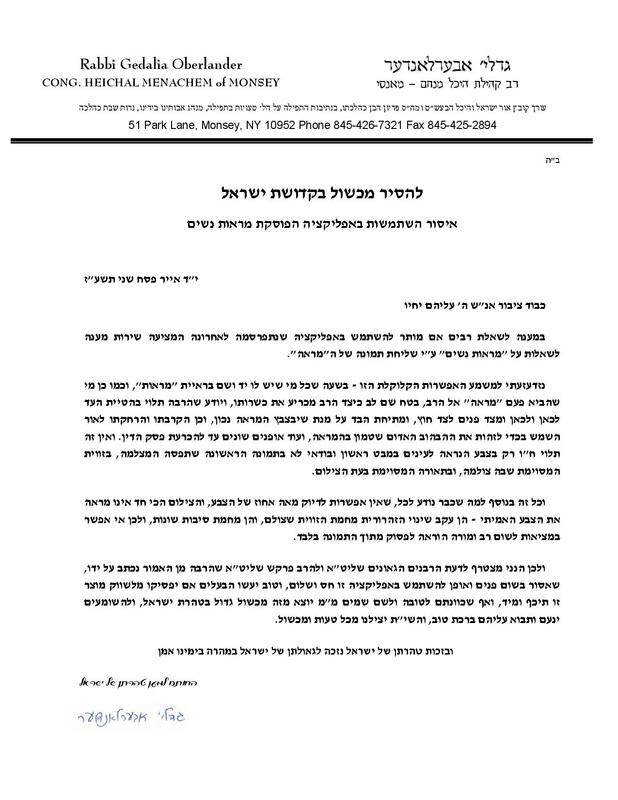 This development comes after four prominent Chabad rabbis have come out publically against the app. 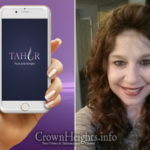 The app, created by Zisa and Yitz Levin of Miami, allows women to submit Bedikah questions to rabbis by taking a photo of the stain and submitting it, bringing privacy and anonymity to what was previously an uncomfortable affair for some women. 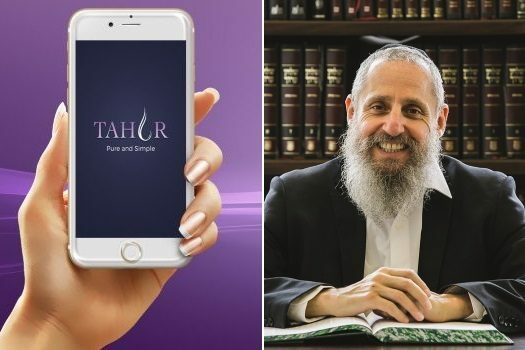 The first Chabad rabbi to publically come out against the app was Rabbi Sholom Dovber Shuchat, who took issue with the app’s limited technological ability to discern between different shades of color under different types of lighting. 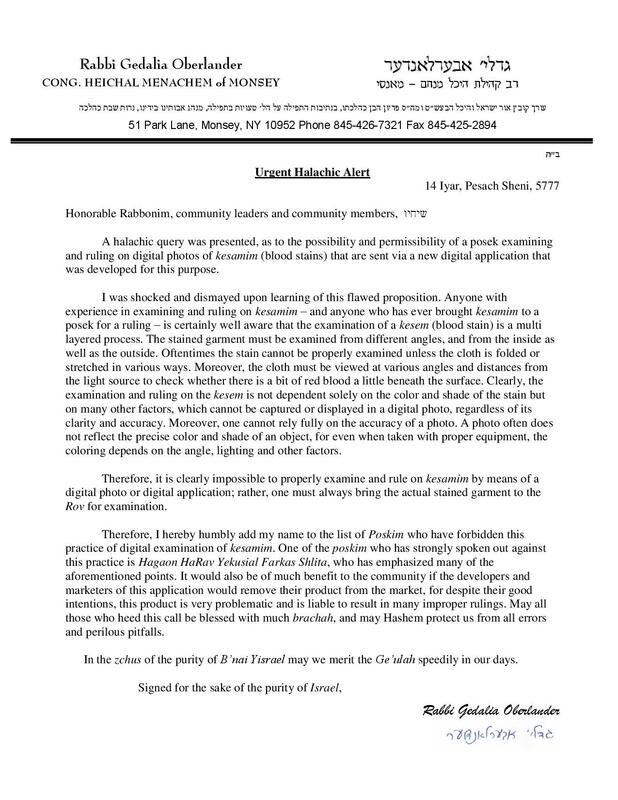 The creators of the app responded to his criticism here. 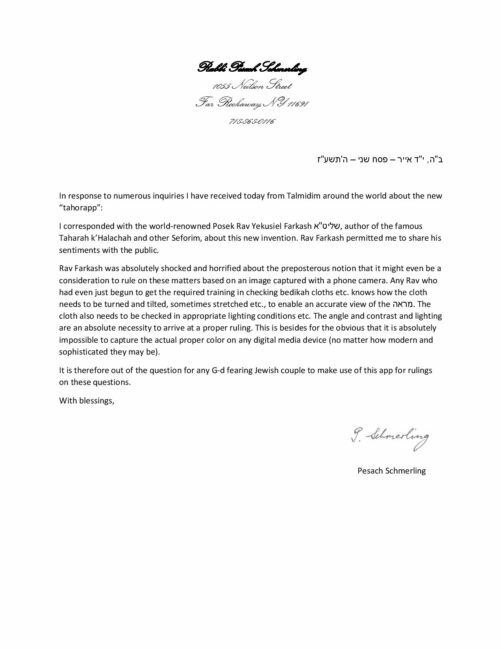 In the 24 hours since the app’s release, an additional three prominent Chabad rabbonim have come out in opposition to the use of the app: Rabbi Yekusiel Farkash of Jerusalem, Israel, author of Taharah K’halacha; Rabbi Pesach Schmerling of Far Rockaway, NY; and Rabbi Gedalia Oberlander of Cong. Heichal Menachem of Monsey, NY. 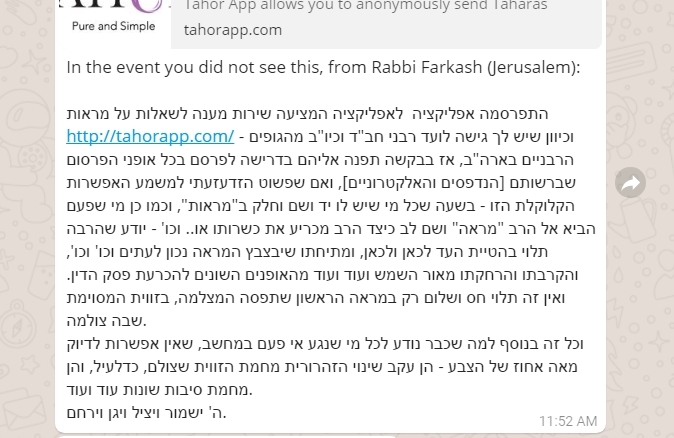 By this morning, the sole Chabad Rabbi to be listed on Tahor’s website, Rabbi Fishel Jacobs, was removed as an endorser. 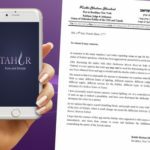 Neither he nor the creators of Tahor have made any public statement explaining his removal. The remaining two rabbis, Rabbi K. Auman and Rabbi E. Davis, belong to the mainstream/modern orthodox Young Israel movement. I do understand and respect the Rav’s objections. But I would mention one point: there are people who live in out of the way places, without a Rav nearby, and for them it is very difficult when there are shaylas. 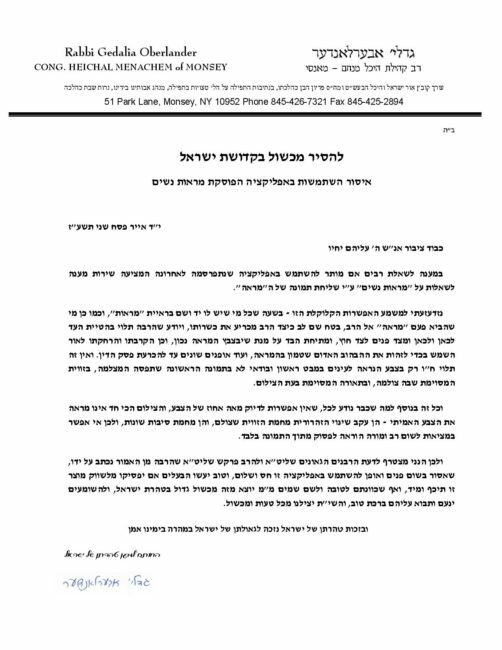 Mailing the shaylas to a Rav is an option but not always a good one: mail can arrive late, get lost, get mixed up etc. etc. And many times until the person gets a response back, several days have gone by. Often it is difficult to know how to conduct oneself or what is one’s status until the Rav responds. That is certainly not a problem to disregard. so this type of app can really be beneficial in such circumstances. Perhaps a way will be found to make it approved? maybe some better technology? It cannot be beneficial to anyone, under any circumstances if it doesn’t work! It is a game of musical chairs. Wow. This completely discredits rabbi Jacobs. 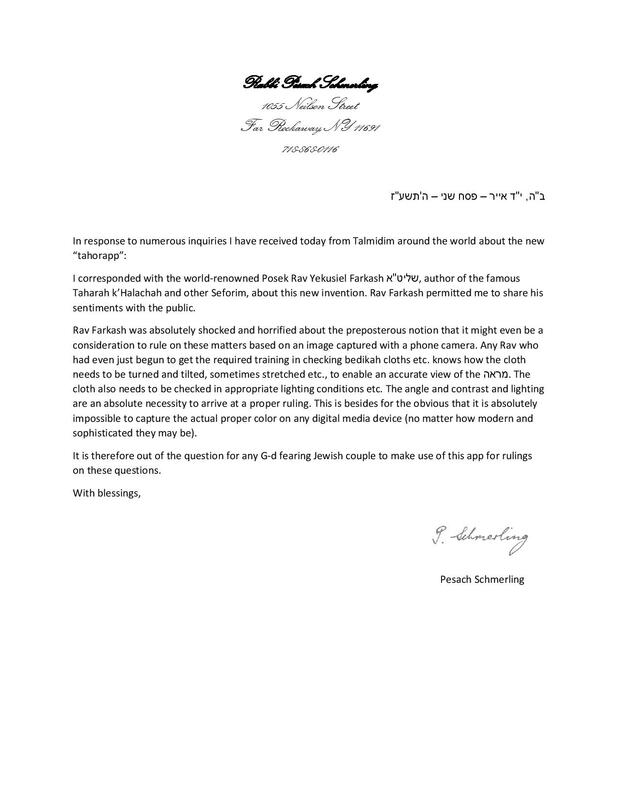 He is an expert on taharas hamishpacha, did extensive research in the first place to support the app, and simply backed down from his beliefs and buckled under the pressure and politics of the Chabad community. I expected better. Yeah, I guess Moshe Rabbeinu is “completely discredited” too, since he changed his opinion when Aharon pointed out to him a fact of which he was unaware (Vayikra 10:20). The ability to be “model al ha’emes” is one of the signs of a wise person (Avos 5:7), so evidently a commenter who sees that as incorrect is, as the Mishnah there continues, a golem. The Dipping App will dip for you. Waterproof your phone and click play. Dip into a mug,and the deed is done. #6 right on target.But do not be to sad. If he is not the expert you tought or he lacks guts good that he backed out now.beofre causing serious damage to innocents.